It was never my intention to keep Fledgling a secret, but the quilt is out and gone now without much in the way of written documentation -- but there was a reason, I swear! It's always hard to admit when a project isn't right. I've had that problem before, and I was grateful later that I stopped quickly before I dug myself into a much deeper hole than I had already done. 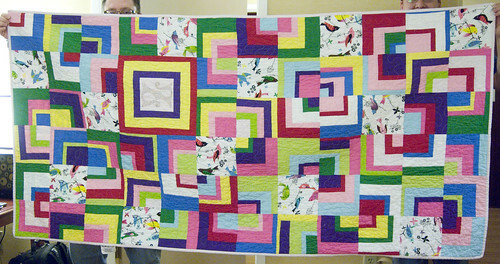 That lesson served me well in this quilt, though it delayed completion by a few months. Where's your sash, Miss America? I'm playing, absently. 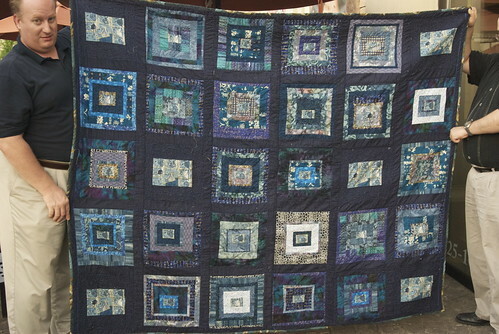 I have lots of blue fabric that wants a permanent home; who am I not to oblige? I wanted something freeform and relaxed, and this seemed like a good way to play. I wish I knew more about the fabric I'm using for the center of each square. It's a print fabric ©2002, but I have no idea who made it. I'm cutting very, very carefully and sewing with itty bitty seam allowances on that center fabric, as a result. Mustn't waste any; I think it's safe to assume I will never find it again.